A lot of people would believe this to be a mad waste of time. Think again. I like to think of my film diary as a personal journey, and here’s why. Films are full of life – be it life re-imagined and projected onto a screen. People have been writing heartfelt criticism on the subject for over a century, good and bad. For some people, films can change their life, for others it can be something to chortle at. Either way you look at it, film provokes a response, a very human being response. But, why should we bother write about these responses? They can instigate thoughts that may have a deep and desirable effect on our day-to-day lives. I am not just speaking for cinephiles when I say this, take a look in the news and you’ll see all sorts of arguments over the power of visual content – movies and games in particular. I notoriously remember the case with Park Chan-wook’s Oldboy being blamed for the Virginia Tech massacre. There is also the argument that movies desensitize us: “Now the act of violence with a gun or a knife is the norm and we in the entertainment industry are partly responsible in making the presence of weapons such as knives almost an acceptable commonplace”, Sir Richard Attenborough. On the contrary, I believe that seeing violence and other matters in the movies can kindle us and make us more aware and susceptible to these themes. Though, you can see the argument overlapping. It befalls on the individual at the end of the day. Film can be a very personal journey, and regardless of how many movies you watch, writing about them can reflect your current demeanor and outlook on life. This outlook will inevitably change over time and that is an interesting arc to discover. Use film as a means to reflect on your current state of mind. Writing your thoughts about a character in a movie is equivalent to writing about your thoughts on the man opposite the street or the girl living next door. The medium of film is irrelevant if you reflect on the characters – humans with various obstacles, behaviors and emotions. Of course, some people may only write notes on the aesthetic/artistic aspects of a film, but by digging into the characters minds we can locate a magical reflection on our world. This is the filmmaker’s greatest task, to give a character that magical human touch. Next time you watch a film, try watching it with this task in mind, and the characters will become an extension of yourself. This may be biased toward my love for dramas, but even movies with aliens and monsters should give off a similar aura. This then becomes dependent on how we perceive various genres of film. I am beginning to think that film is just a cycle of contradicting gestures – much like life. But, lets not forget how important and powerful film aesthetics can be. You may discover a hidden desire for a certain look and feel that a film gives you – it could be the aura of a period drama, or more specifically, the unnerving sensation that stark lighting in film noir gives you. 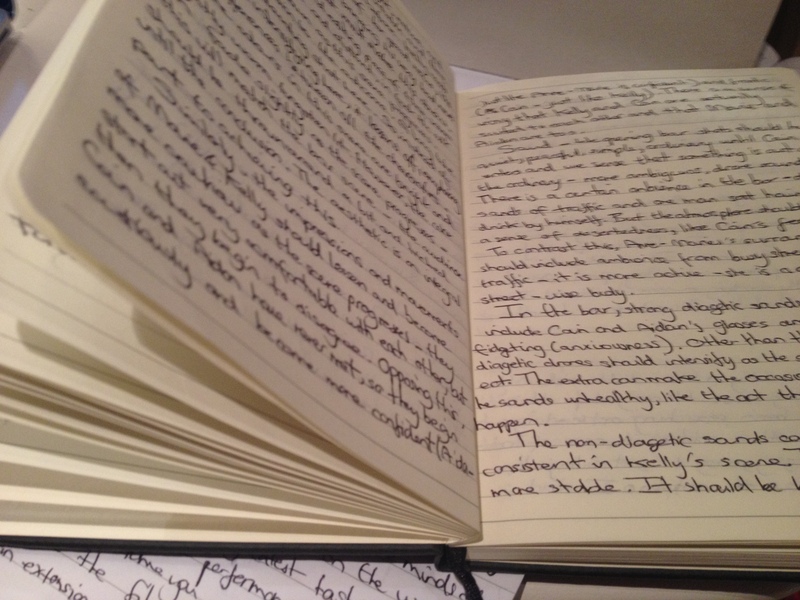 Besides film analysis, the reflective experience of writing a diary can be liberating and great for your film knowledge. If you keep track of the films you watch you will be able to tell your friend when he or she asks what you want to watch: “Yes, I have seen that”, rather than “Not sure, lets try it” and then half way through you release you have seen it and know how it will end! When you write down a film noting its title, crew and cast details etc. you will not easily forget it, unless it is terrible. Though unfortunately, in many cases, it is the terrible films that are the most memorable! Much like, “why is it the negative reviews that stick?” Mark Kermode. Writing about film can also give you a better understanding of what genre or style of film you like best and why. As you begin to note differences in characters, story arcs, designs, locations, cinematography etc. it will become apparent to you that a secret language is operating in film. A language that sweeps the sand from its tracks and allows the audience to become invested within a certain story structure and canvas. What I am trying to get at is that if you are not consciously aware of how you are being affected when you watch a film and wish to reflect and understand it a bit more, then write a diary. You will be surprised about your unique insight – everyone has one when it comes to rummaging through the world of a film. For those who are already film lovers, then you probably already have a film diary, so keep filling it! I absolutely love reading film reviews especially if it’s a critical review that examines all facets. I hate when people write a film review and all they do is praise the film or, god forbid, just summarize it. Even so, I understand that writing a nuanced critique of a film is really difficult. I tried to write film reviews, but I’m a terrible writer and wasn’t worth my efforts. Maybe in the future I’ll be compelled to write, but at the moment my film blog is focused on compiling screenshots from various films as a visual snapshot.